Our Lady of the Lake Livingston, a 140,000 square foot medical complex is located just south of I-12 at the Walker exit. The complex offers a free-standing Emergency Room open 24 hours a day and is staffed by emergency physicians and nurses for the treatment of urgent and emergent medical conditions. If a patient has to be admitted to a hospital, they will be transported by ambulance. 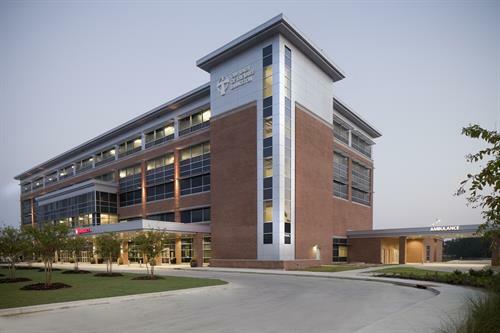 In addition to emergency services, Our Lady of the Lake Livingston’s campus also includes outpatient services such as a lab; imaging services such as CT, ultrasound, digital X-ray, Mammography, Dexa Bone Density and MRI; a retail, onsite pharmacy; and physician offices. Primary care doctors and many specialists such as cardiology, orthopedics, ear nose and throat, eye specialists, allergists, vascular specialists, urology and pain management doctors occupy the onsite physician office space. The 236-acre site also includes a 50-60 acre lake. Our Lady of the Lake Livingston is a division of Our Lady of the Lake Regional Medical Center in Baton Rouge.